With the release of the new Bermuda Triangle clan booster for Japanese meta, the new stride-harmony based deck is looking very strong in recent testings. Before saying anything else, I think I should explain the concept of Harmony. 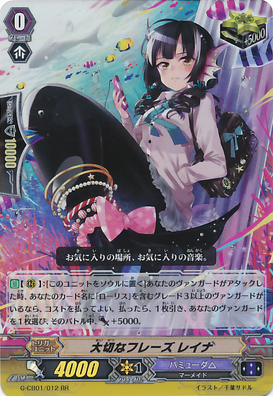 [AUTO](VC)[1/Turn] Generation Break 2 (This ability is active if you have two or more face up G units in total on your (VC) or G zone):When this unit becomes Harmony state, choose two of your units, they get [Power]+5000 until end of turn, and this unit gets [Critical]+1 until end of turn. [AUTO](VC):[Counter Blast (1)] During your turn, when your G unit Stride, you may pay the cost. If you do, choose one of your rear-guards, and return it to your hand. If you return a unit this way, draw a card. [CONT](VC) Generation Break 1 (This ability is active if you have one or more face up G units in total on your (VC) or G zone):During your turn, this unit gets [Power]+5000 for each of your units in Harmony state. [AUTO]:[Counter Blast (1) & Soul Blast (1)] When this unit is placed on (VC), you may pay the cost. If you do, look at five cards from the top of your deck, search for up to one card with Harmony ability from among them, reveal it to your opponent, put it into your hand, and shuffle your deck. Take a good look at these 3, and try to figure out a combo in your head, while I move on to the main techs of the deck that make it so powerful. [AUTO] Generation Break 1 (This ability is active if you have one or more face up G units in total on your (VC) or G zone):[Counter Blast (1)] When this unit is returned to your hand from (RC), you may pay the cost. If you do, draw a card. [AUTO](RC) Generation Break 1 (This ability is active if you have one or more face up G units in total on your (VC) or G zone):[Counter Blast (1)] When this unit attacks a vanguard, if this unit is boosted, you may pay the cost. 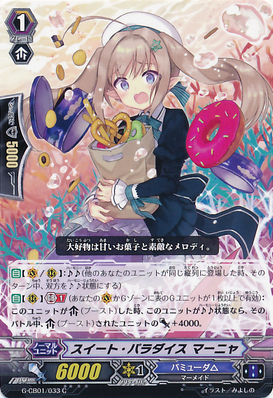 If you do, choose one of your other rear-guards, return it to your hand, choose up to one card from your hand, call it to (RC), and that unit gets [Power]+3000 until end of turn. [AUTO](RC) Generation Break 1 (This ability is active if you have one or more face up G units in total on your (VC) or G zone):When this unit's attack hits a vanguard, choose one of your other rear-guards, return it to your hand, if this unit is in Harmony state, choose up to one card from your hand, and call it to (RC). 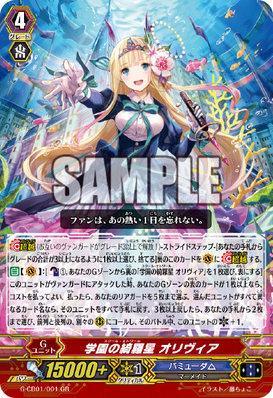 [AUTO](RC)[1/Turn] Generation Break 1 (This ability is active if you have one or more face up G units in total on your (VC) or G zone):When this unit becomes Harmonystate, look at five cards from the top of your deck, search for up to one grade 3 or greater card from among them, reveal it to your opponent, put it to your hand, and shuffle your deck. [AUTO](RC) Generation Break 1 (This ability is active if you have one or more face up G units in total on your (VC) or G zone):When this unit boosts, if this unit is in Harmony state, the boosted unit gets [Power]+4000 until end of that battle. 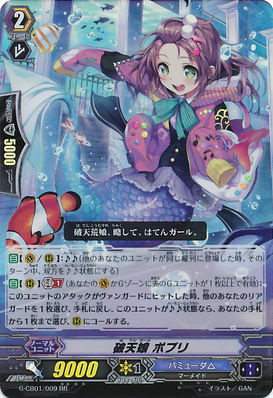 AUTO](RC):[Put this unit into your soul] When your vanguard attacks, if you have a grade 3 or greater vanguard with "Lauris" in its card name, you may pay the cost. If you do, draw a card, choose one of your vanguards, and it gets [Power]+5000 until end of that battle. 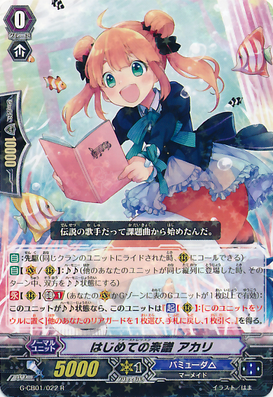 [CONT](RC) Generation Break 1 (This ability is active if you have one or more face up G units in total on your (VC) or G zone):If this unit is in Harmony state, this unit gets "[ACT](RC):[Put this unit into your soul] Choose one of your other rear-guards, return it to your hand, and draw a card.". Stride (Released when both players' vanguards are grade 3 or greater! )-Stride Step-[Choose one or more cards with the sum of their grades being 3 or greater from your hand, and discard them] Stride this card on your (VC) from face down. 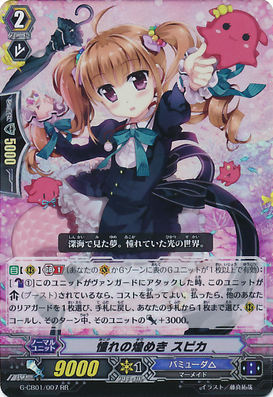 [AUTO](VC):[Counter Blast (1) & Choose a face down card named "School Etoile, Olivia" from your G zone, and turn it face up] When this unit attacks a vanguard, if the number of face up cards in your G zone is one or more, you may pay the cost. If you do, choose up to five of your rear-guards. If all of the chosen units have different card names, return them to your hand. If the number of cards returned is three or more, choose up to two cards from your hand, call them to separate (RC) in your front row and back row, and this unit gets [Critical]+1 until end of that battle. More combos forming in your heads now guys? Spica attacks boosted by Manya, skill activates. Bounce the rested Spica, call Potpurri in her place(5th attack). Assuming your opponent did not get any damage triggers during this whole combo, this is arguably the current best game-ender in Bermuda Triangle. Similar concept to Ethics Buster Reverse's "Infinite Hell", a counterblast 3 is kinda justifiable in this case. The deck's defensive power is just as good as the offensive power. 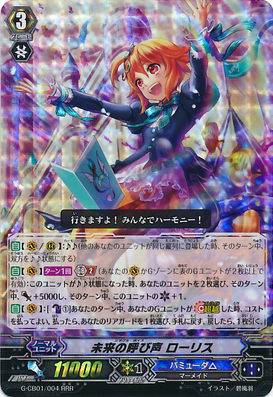 Lauris' on stride skill lets you bounce a unit, and draw a card, for 1 counterblast. If you bounce Emilia, it's a draw 2 for 2 counterblast. Reina helps you draw more during your battle phase, so you have more options to bounce and call different units throughout the battle phase. 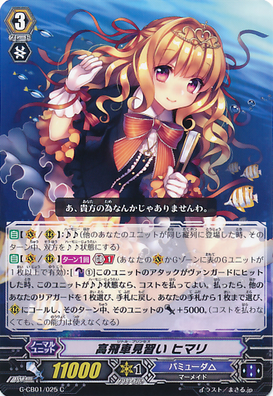 You can also use this when your Vanguard is Olivia, provided your Heart is Lauris, since the G unit inherits the name of the Heart. Akari's skill lets you draw even more to boost your defensive capabilities. 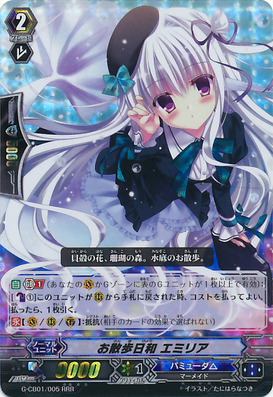 Assuming she is in Harmony state, use her to bounce Emilia, and net a draw 2 for 1 counterblast. 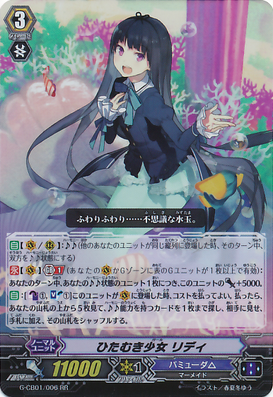 Shizuku's tech helps to filter the deck by finding you stride fodder and Himaris, increasing your handsize even more to possibly fool your opponent into thinking there's alot of shield in your hand(which there probably is from other effects). For those of you sick of my babbling, here's a decklist for you to consider. I personally saw this deck in my past 3 shop tournaments, and died 2-0 in all of my match-ups against them. I may not have mentioned Kukuri, but she is simply the G-era type negate, which lets you unflip if you guard with her and there is another copy of herself in the drop zone. Kura is one of those 5K soulblast 2 unflip 2 cards, which really is a must in this deck which eats up counterblast at the speed of light. 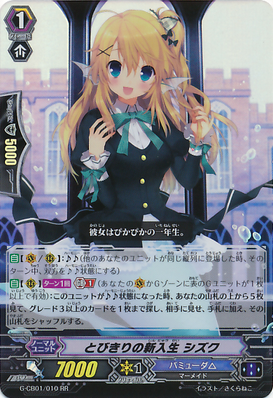 Amoris is the FC2015 RR if you're wondering, which is a good option for your first stride, letting you bounce 2 cards on the field the moment she appears. Somni is the other good option for your first stride, as she is another pressure unit which lets you bounce one RG and call another, giving it 3K, if her attack hits the opponent's Vanguard.